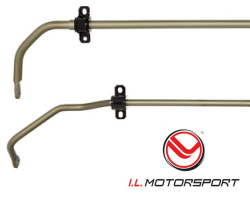 One of the most cost effective modifications you can make to the MX-5 is to upgrade the chassis anti-roll sway bars. Fitting stronger and larger bars will work to reduce body roll in corners, increase steering response, and give the driver more confidence behind the wheel. The anti-roll bars (ARBs), in combination with your springs and dampers, can also be used to tune the car's handling balance between oversteer and understeer. There are two types of bar, solid, and tubular. Solid bars are the simplest and heaviest and are usually made of steel. Tubular bars weigh less with the higher-end ones being made of chromoly steel. Many of the aftermarket bars featured here have multiple mounting points allowing adjustment to the anti-roll effect, with the furthest attachment giving the softest setting. The bars are usually sold as kits including new stronger mounting brackets and urethane bushings, though with some you will have to re-use your existing mounting hardware. When upgrading your ARBs it's a good idea to fit new droplinks too as the stock parts are fairly weak. It's also worth noting that RX-8 bars will fit the MX-5 due to the chassis being very similar, and a popular low cost upgrade is to retrofit the yellow marked bars from an RX-8 with the sports suspension pack. Mazdaspeed bars were available from the accessory catalogue. They were advertised as being 28% stiffer than stock parts and came in a smart red finish. The Mazda part number was GRMS-8M-D16. 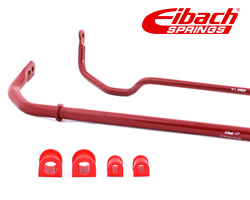 These Eibach bars are made of steel and feature a red powdercoat finish. The front bar is 26mm with 2 adjustment settings. The rear bar is 16mm with no adjustment. 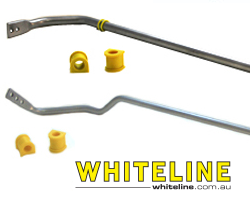 Whiteline bars from Australia are made from solid steel and have a metallic silver powdercoated finish. The front is a 24mm bar with 2 settings. The rear bar is 16mm with 3-way adjustment. This set of bars from IL Motorsport in Germany is made from aluminium. They are not adjustable but are said to be 35% stiffer and 45% lighter than the original Mazda parts. 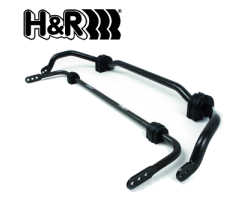 Also from Germany, these bars by H&R feature a black finish. The front bar is 22mm with 2 adjustment settings, the rear is 16mm also with 2 settings. 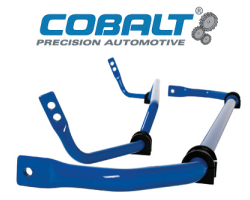 The Cobalt bars have a bright blue coating. The front bar is 1" diameter but not adjustable, the rear is 0.625" and has 2 settings. 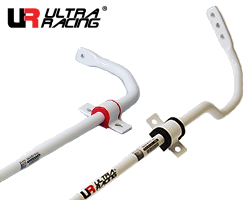 Ultra Racing's bars are made from steel and feature their signature white finish. The front is a 23mm bar and the rear is 16mm. They also do an RX-8 front bar at 29mm which can be fitted to the MX-5. 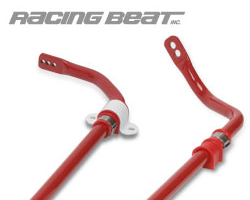 The Racing Beat bars are made of tubular chromoly steel. The front bar is 1" diameter with 3 adjustment settings. The rear bar is 0.75" and has 2 settings. Racing Beat also do an RX-8 front bar at 1.25" but this has no adjustment. 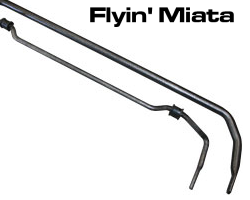 Flyin' Miata's bars are also made of a tubular chromoly steel and feature a smart grey finish. The front bar is 1" diameter and has 2 settings, the rear bar is 0.75" with 3 adjustment settings. 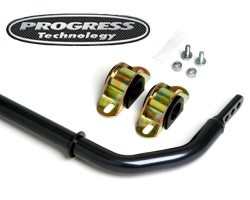 Progress Technology bars feature a metallic grey powdercoat finish. The front is 28.5mm tubular steel with 3 levels of adjustment. The rear bar is 17.5mm solid steel with 2 settings. 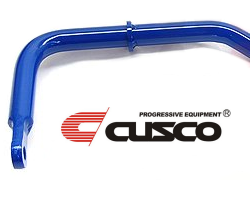 Cusco sway bars feature a blue finish. The front is 22mm with 2 adjustment settings, the rear is 14mm and also has 2 settings. 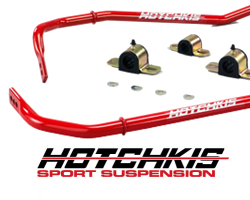 Hotchkis bars use a hollow design with 3 levels of adjustment for the front and rear. The front bar is 27mm and the rear is 21mm, also included are polyurethane bushings and heavy duty brackets. 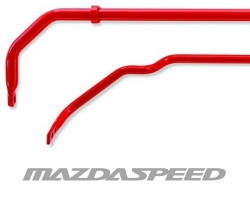 The bars from AutoExe are a solid design with a red finish and look very similar to the Mazdaspeed parts. Both bars have 2 levels of adjustment with diameters at 21mm for the front and 14mm for the rear. They also do a larger RX-8 set with 28mm front and 17mm rear, each with 2 settings. 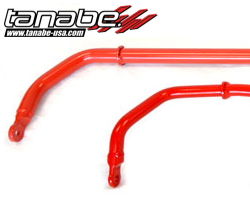 These Tanabe Sustec bars are intended for the RX-8 but they may fit the MX-5 too if you're looking for a large set. 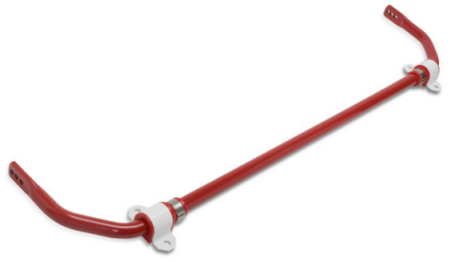 They are made from chromoly steel in red finish, with the front at 30.4mm and the rear at 20.4mm.